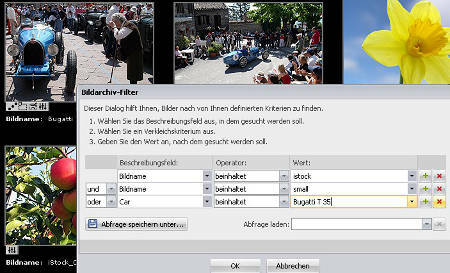 StudioLine Photo Classic 3 offers a variety of look-up strategies, such as a simple search, the timeline explorer, searching by keywords, categories and image rating, as well as the “Image Archive Filter”. The following workshop will expand on the latter. The intuitive “Image Archive Filter” wizard makes creating queries easy. We want to find images that have not yet been assigned any keywords, categories or ratings so that they may be indexed and rated appropriately. In the “Descriptor” drop-down list, open the IPTC/NAA Descriptors node and choose “Keywords”. From the “Operator” drop-down list, choose “equal to”. Leave the “Value” field empty. Click the “Image Archive Filter” button in the navigation pane (bottom left of the StudioLine screen), to launch the “Image Archive Filter” panel. To save this custom query, click the button “Save Query as…”, type the name “Images without keywords” and click “OK”. To reuse a previously saved query, choose from the drop-down list “Load Query”. To begin filtering, click the “OK” button of the “Image Archive Filter” panel. The “Image Archive Filter” folder list in the navigation pane on the left will show any folders with matching images. 1. If a search turns up a large number of images, then it may be best to navigate one folder at a time and assign appropriate keywords to the matching images. The result is a consolidated display of all matching images that are contained in the selected folder and its subfolders. The subfolder icon with the “eye” symbol confirms that images from these subfolders are already shown. located above the folder list. In the “Image Archive Filter” panel, click the “+” symbol and the end of the first row to add a second condition. The “and” operator at the beginning of the second row specifies that in addition to having no keywords, matching images must also satisfy the second condition of having a “rating less than 1”. The hint at the bottom of the panel indicates that there are 10 images that have no rating and have not been assigned any keywords. Using an “or” operator between two conditions means that matching images only need to satisfy at least one of the conditions to be included in the search results. In this example there were 124 images where the image name contained “istock” or where there rating was higher than “3”. or any images where the user descriptor “car” includes the term “Bugatti T 35”. To discard a condition, click the “remove” button (red “X”) at the end of its row. StudioLine automatically saves your current query under the name “Most recent query”. To retrieve it, simply choose the most recent query from the “Load Query” drop-down list. 1. If you already know that you are likely to need the same query again, save the query with a meaningful name. 2. To replace a previously saved query after enhancing it, simply save the updated query, using the same name, by choosing the name from the drop-down list of the “Save Query” panel.